The beautiful ocean and golden sands at Watergate Bay are within a 10 minute downhill stroll of Bayview. 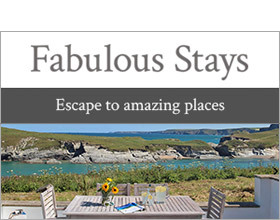 Positioned in the little hamlet of Tregurrian with sea views, it makes a wonderful holiday homestay four miles from Newquay and seven from the iconic resort of Padstow, with award winning eateries and pubs. Watergate Bay is perfect for sandcastle fun, beachside picnics and is famed as one of the finest surfing beaches in the county. Enjoy an exhilarating ramble along the cliff tops with stunning countryside vista and waterscape beyond. Close by is Jamie Oliver's 'Fifteen' restaurant, a great dining venue aside the beach with its incredible view across the bay. Towan Beach at Newquay is popular, safe and sheltered for swimming with gentle surf for novice boarders. The Blue Reef Aquarium and Newquay Zoo are great attractions for all the family. Water enthusiasts are spoilt for choice with Fistral Beach, a surfers' paradise. Hire bikes at Padstow and cycle along the scenic, level Camel Trail through the spectacular countryside or walk 10 minutes from Padstow to St George's Cove with lush estuary views. Hop aboard the ferry to Rock, which sails every 20 minutes. Within a half hour drive discover the buzzing community at Trevaunance Cove in St Agnes and after a dip in the sea or coastpath ramble, enjoy refreshment from the Driftwood Spars Inn with its award winning ales. Equal in distance is Truro city with eateries, retail fix, cinema and theatre. The incredible Eden Project is 20 minutes by car. Bayview nestles in a small tranquil close of terraced cottages. Superbly presented and spacious, the accommodation is homely and ideal for families, couples and gathering of friends seeking a fusion of beach and countryside. From the comfy sitting room with dining area, an open staircase leads up to a smart bathroom and three pretty bedrooms, two with ocean views. The well equipped kitchen leads out to a private courtyard garden; a super sunspot for languid breakfasts, barbecues, evening tipples and a spot to dry off the surf gear in readiness for another surf-tastic day! Three bedrooms: 1 x king size double with TV, 1 x twin (zip/link to super king on request) with TV and en-suite basin and WC, 1 x bunk room. Bathroom with bath, shower over, basin and WC. Open plan living space with sitting area and dining area. Kitchen. Beach and seasonal bar 0.5 miles.